Petrude Olds, Seattle Opera’s Props Manager, has been working backstage since 1984. Not only has he developed a vast array of stage props, but he has also made his way into company legend for “saving” the opening of the 1986 Das Rheingold. An immense sheet of blue nylon, representing the Rhine, got stuck in full view of the audience. A quick-thinking Olds scrambled up a twenty-foot ladder and freed the fabric seconds before Fricka started to sing. Rhine safely in hand, Olds stayed put, hidden from view for the rest of that long scene. What props should we expect to see in The Consul? The big props are the magician’s props. We have hired a magician to train the tenor to do several magic tricks, things like a wand that shoots fire, a dove trick, scarves of many colors, flowers that come out of a wand. The ones he does best will end up in the show. Will there be any guns or gunfire? Potentially. Guns came with the show when we purchased it from Arizona Opera, but as of yet we don’t know if we’ll use them. The director will make those choices. Is it common for directors to be figuring out what they need as they go? Yes. Before directors get here, they’ve looked at the libretto and started figuring out how people are moving [on the stage]. Sometimes the libretto indicates what kind of props are in the show, and the directors will usually add to the list. If we have a prop, we provide it; if not, we purchase or create it. Can you give an example of one you’ve made? In The Tales of Hoffmann, there is a young lady who turns out to be a doll. The doll’s head then gets taken off. In 2005, the cast was multiracial, so we ended up buying two mannequins so that we could make each one appear as the singer who was singing the role that night. We made a cast of the singers’ faces which we then put on a Styrofoam head that then screwed on to the body. When we first started rehearsals, the director hadn’t made any of those decisions. What was your training before you started here? It seems like you have to know how to do everything. When I was young, my parents let me do lots of things, got me to do lots of things. I learned to do leather work when I was in elementary school; my dad worked in movie theaters, so I learned a lot about A/V (and how to clean, because he’d make me clean the theater after the movies). I was a Boy Scout and learned knots, how to use weapons, all those things. Being a prop guy, I use all those skills. Do you have a background in music? I played trombone in college, but I ended up working in the theater. I had to be onstage once. That was more than enough for me. Except that we always see you onstage taking a bow after the dress rehearsals. What’s the story there? I’m really the stand-in conductor for bows at rehearsal. At performances the leading lady usually comes out and gets the conductor to bring him onstage for the bow, but at one particular rehearsal the conductor was still in the pit working with the orchestra. I was standing there, and the stage manager asked if I would go out instead. “Sure.” So the soprano came over, and they put my hand in hers, and I went out and did the bow. They kept asking me to do that, and that was years ago. What do you do outside of the opera? Who’s got time? I like to volunteer. The latest volunteering project is in the elementary school where my daughter teaches music. Can you talk a little bit about any of the educational events you have hosted? This past summer my union [IATSE #15] asked me to do a class about the props in the Ring. It was open to the public. We had 18 people; most of them were teachers and a few students. 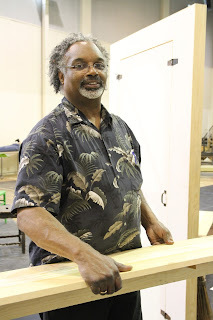 They got to handle the props, and see the blueprints and the process of making the props in the show. There are a couple YouTube videos of other presentations I have done for Seattle Opera. As someone with all these skills, do you find yourself getting roped into strange projects outside of work? I had two kids go through public schools, and I built haunted houses at school. I’ve been an auctioneer at school functions, I’ve been a chaperone on many trips, and I’ve helped with plays and musicals at schools. You don’t necessarily get roped into it, but how do you say no? This Staff Chat first appeared in Seattle Opera’s program for The Consul in February 2014.